The Roaring Riptide of P.K. 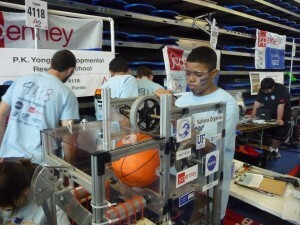 Yonge, the school’s FIRST Robotics Team, competed in the South Florida FIRST Robotics regional competition this spring, and while the rookie squad didn’t walk away with official honors, the team was invited to present their robot at the Gator Engineering Design Expo later in the year at the UF Reitz Union, and also in the Integrated Product and Process Design (IPPD) meeting. Pictured, above and below, members of P.K. Yonge's Roaring Riptide robotics team (wearing light blue T-shirts) set up for their FIRST regional competition. FIRST is an international robotics competition founded by Segway creator Dean Kaman. 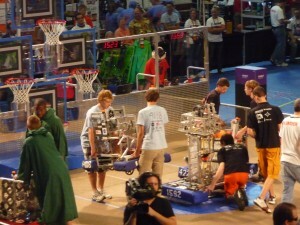 Competing teams build and program a robot to perform prescribed tasks against a field of competitors. More than 30 Blue Wave high school students are participating. The Riptide squad was an ethnically mixed team and also had a nice blend of boys (11) and girls (six) among the 17 team members. Riptide faculty adviser Kerry Thompson, a physics and biology teacher, said the experience is having a big impact on the students, academically and personally. Back at PKY, Thompson said the students were not very communicative but now interact frequently in class. Those who seemed to be lacking direction in planning their futures are now excited about robotics and pursuing engineering careers and many are eager to volunteer after school to start up robotics for younger students. Some parents even expressed wishes for seniors to stay back a year and do it all again. She said mentors coach and guide the robotics team members, but students develop solutions and do the work. Thompson’s requirements won’t allow students to sacrifice academics for participation: “No Ds or Fs,” even when build season demands commitment six nights a week. Mentors aiding Thompson (P.K. Yonge) included two Harp Engineering employees, a UF mechanical engineering instructor, two UF engineering graduate students and a local handyman.